The RRS held its monthly meeting for June 2018 on Friday the 8th at the Ken Nakaoka Community Center in Gardena. We were well-attended but got a late start on the agenda items. Wilbur Owens came back to see us again and has decided to become a member. Mohammed Daya who has joined the RRS also was able to stop by before the meeting started just to say “hello”. We were also glad to have Sam Austin back in town. Sam is a student at MIT interning at SpaceX this summer. 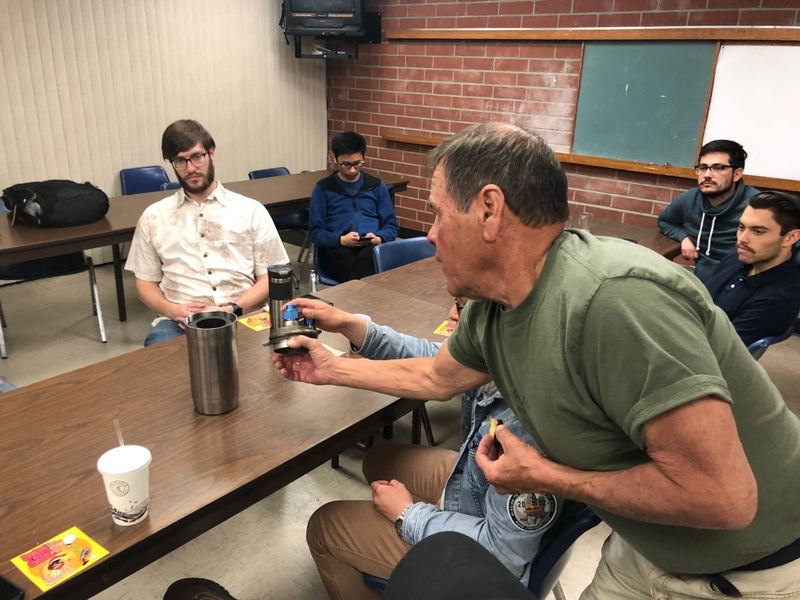 He also paid us a visit both at the MTA on June 2nd and at the meeting tonight to discuss the liquid motor he built. 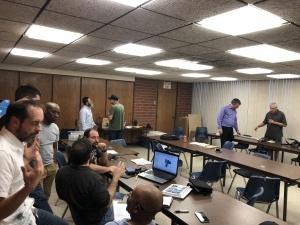 There was lots to talk about at this June meeting between our outreach events and the hot fire testing. 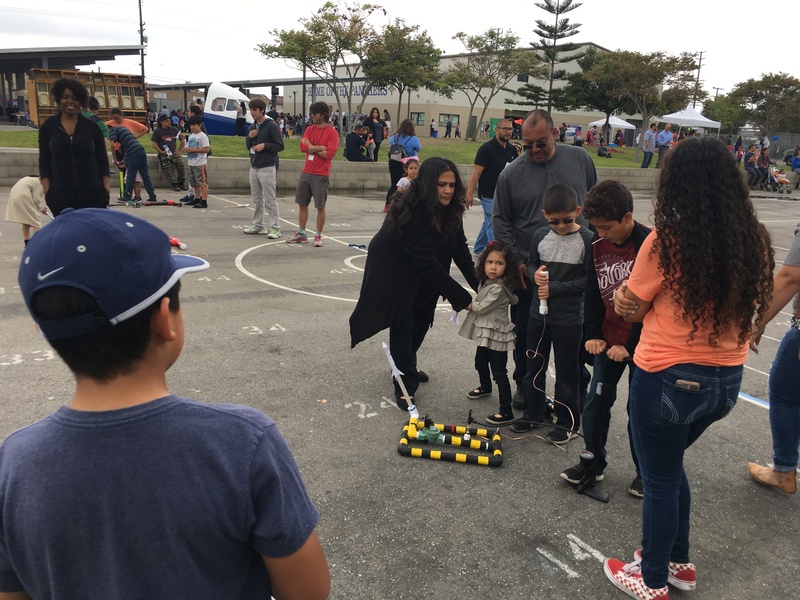 The RRS event at the Two-Bit STEAM Circus in Hawthorne was quite a success. The RRS was a bit short-handed, but we have great volunteers that stayed busy the whole time. The air rocket launcher was one of the big hits at the Circus event and we have been invited back for the next event in September. Frank made some improvements to the paper rocket template that is cut, folded and secured with tape to make the narrow tubes with attaching fins that comprise a paper rocket for the pneumatic launchers we have. The build process can be challenging for some, but it always is satisfying to see the finished product fly. The RRS is glad to have these events and we will surely do more. Here’s some photos that Osvaldo took at the event. RRS at the Two-Bit Circus STEAM Carnival in Hawthorne, CA. Frank works with kids to make the paper rockets for the RRS air launcher. The air launcher is made ready to fire a paper rocket. On a side note to this topic, USC is having a CRASH STEAM Carnival in 2019. We were invited to attend this year’s carnival, but the RRS is shorthanded and couldn’t support. 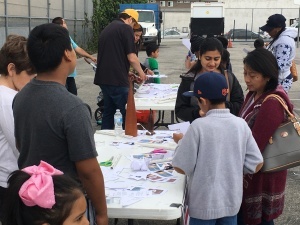 We hope to expand our society to be able to come out for more events across the great city of Los Angeles. We’ll have more information on this event later. 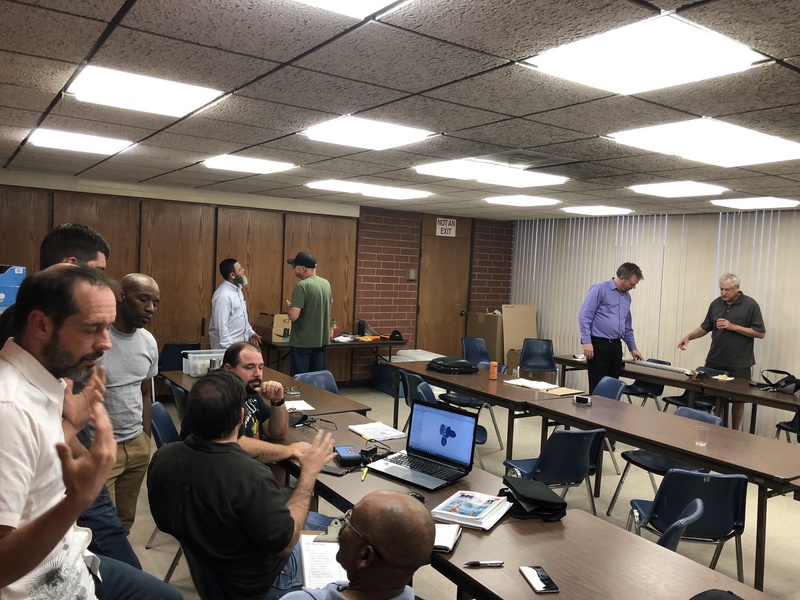 UCLA held their launch event at the MTA on June 2nd. 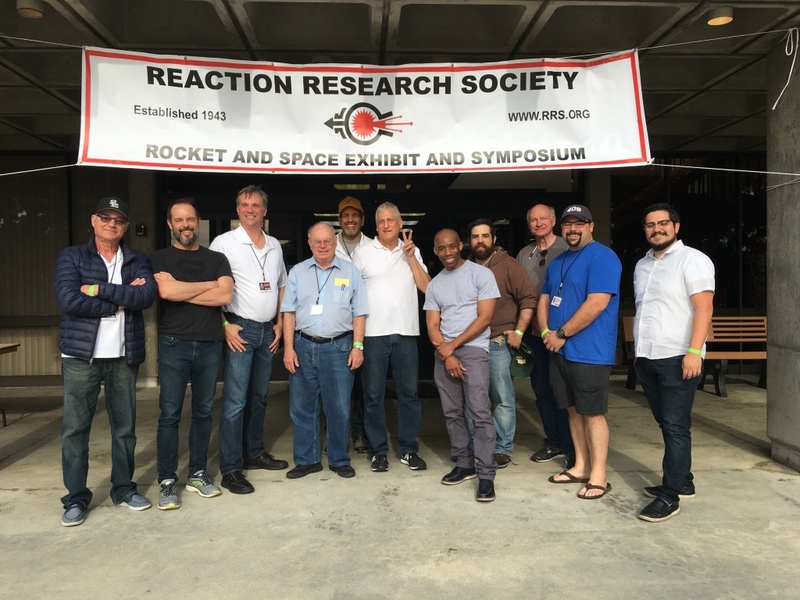 The event was two-fold, it was the final project for the UCLA rocket propulsion class taught by Dr. Spearrin. 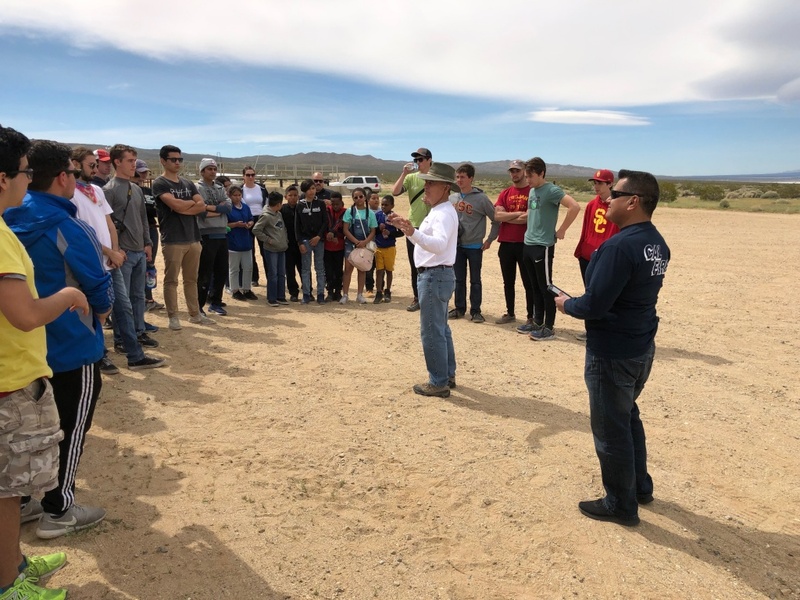 It was also an opportunity for the UCLA Rocket Project team to static fire their hybrid motor. The event was a success for the class with the winds being nearly calm for most of the day. 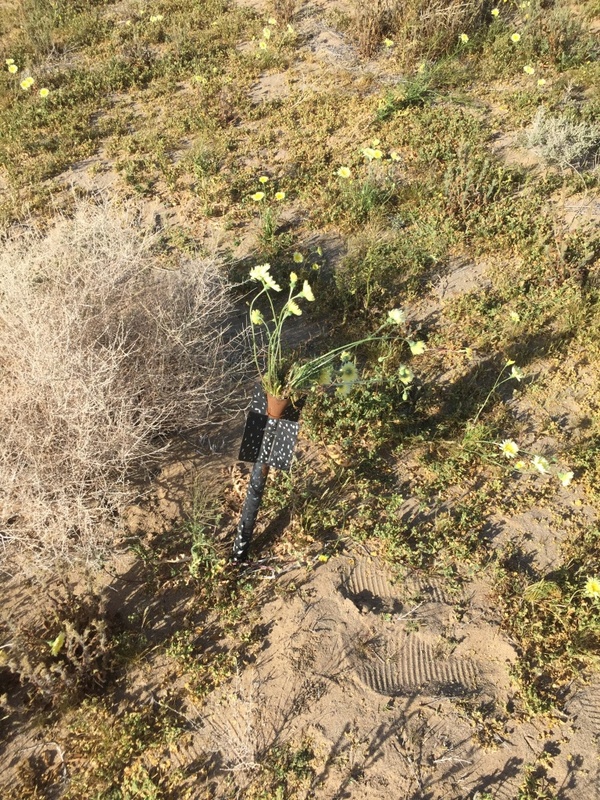 The small hobby rockets with F-sized motors reached good heights without being carried too far by the winds. Each had an altimeter and a hard-boiled egg as a payload that had to be safely recovered. Most were successful, but others not so much. A full write-up was done on an earlier RRS posting. As a further note, UCLA was using a Jolly Logic Altimeter 3 model in their hobby rockets. These devices used by UCLA have proven to be very reliable and easy to use. The RRS will acquire some of these to fly in the payload tube of an alpha rocket to see what heights we reach in this micrograin mainstay rocket of our society. After UCLA’s static firings of their hybrid motor, the RRS flew an alpha rocket with a parachute system. This is a first in a long time. 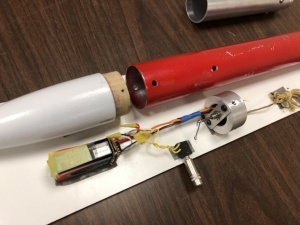 Osvaldo’s design had a safety switch to engage the battery only when the rocket is loaded to prevent it from getting depleted in waiting for launch. The parachute system also had a pull pin to start the timer circuit when the rocket lifted out of the rails. Osvaldo did bring another prototype of the alpha parachute system to discuss its features at the meeting, but we didn’t have enough time. After the June 7 launch event at the MTA, Osvaldo managed to find an RRS standard beta launched by UCLA last year. Although the payload segment sheared off in the extraction process, the nozzle is the precious part that can be cleaned up and reused. Osvaldo was also kind enough to make the adapter piece necessary for testing the RRS standard alpha second-stage solid motor I designed in the horizontal thrust stand at the next event. 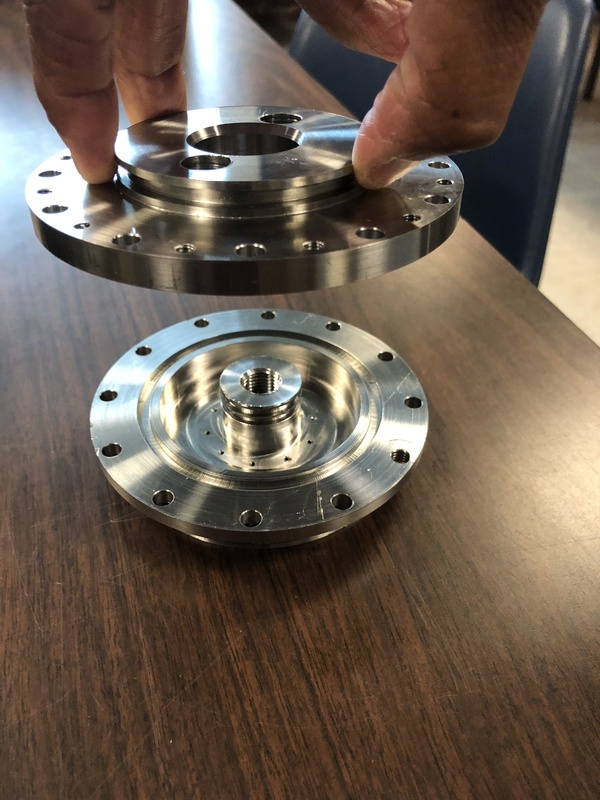 With this simple doubled-ended adapter that goes in place of the nose cone, the second stage motors once finished can fit into the load cell adapter and the RRS can get thrust measurements. 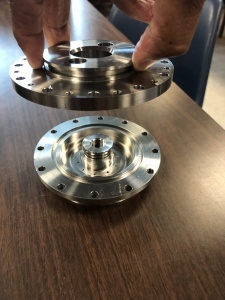 Chris Lujan is working on a sucrose-KN solid grain and Larry Hoffing is working on an AP/HTPB/Aluminum motor grain. I have done the preliminary calculations for both and pressures should be appropriate for the 1.75″ aluminum payload tube. More discussion on this topic in future posts. 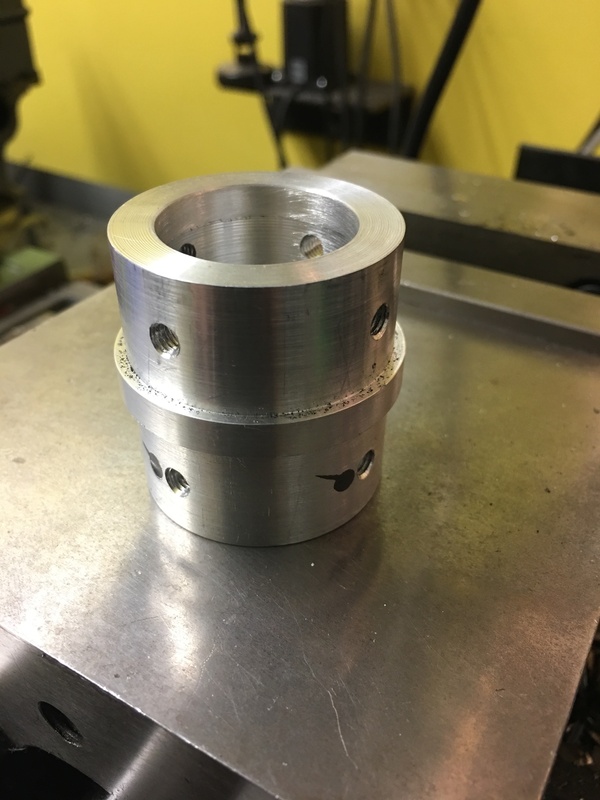 RRS alpha second-stage load cell adapter piece for the horizontal thrust stand. It goes in place of the nose cone. The next RRS build event with the LAPD CSP officers will be with another group of kids in the Jordan Downs housing projects of Watts. 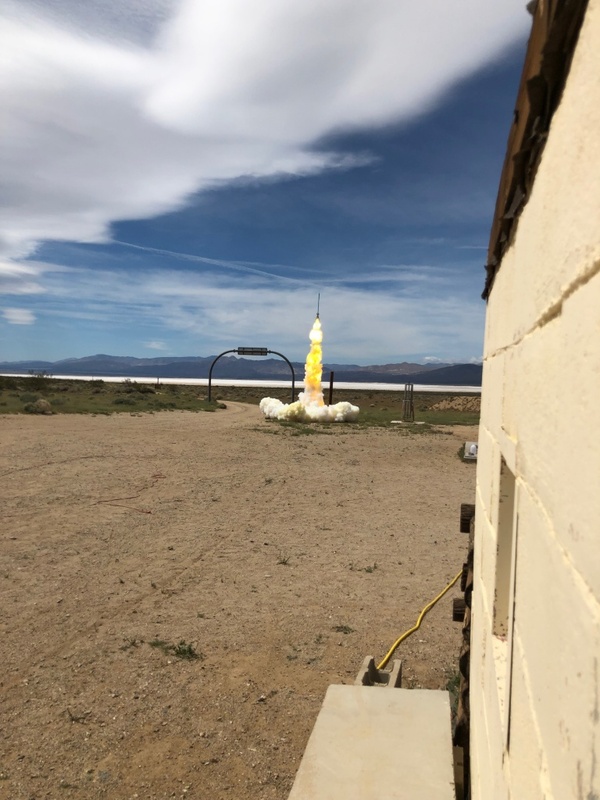 We’ll get started next week, 6/15/18, and run six educational sessions on Friday’s and Saturday’s until the launch event at the end of the program at RRS MTA. This will take place on July 21, 2018. This had to be re-scheduled due to the extreme heat predicted for the original date of July 7th. 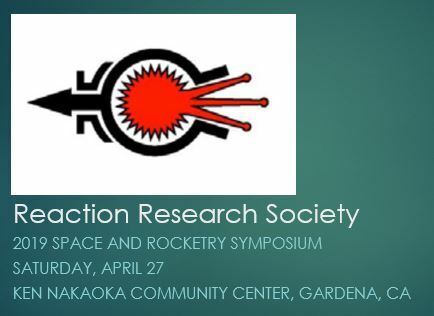 The students will paint and assemble a set of RRS standard alpha rockets. More alpha rockets means more fun for our guests and also more opportunities for our RRS members to try payloads. It’s my hope we can demonstrate another one of Osvaldo’s parachute systems and fly an altimeter chip if we can secure one in time. Richard Garcia said that he already has an Eggtimer Quark chip which has an altimeter. 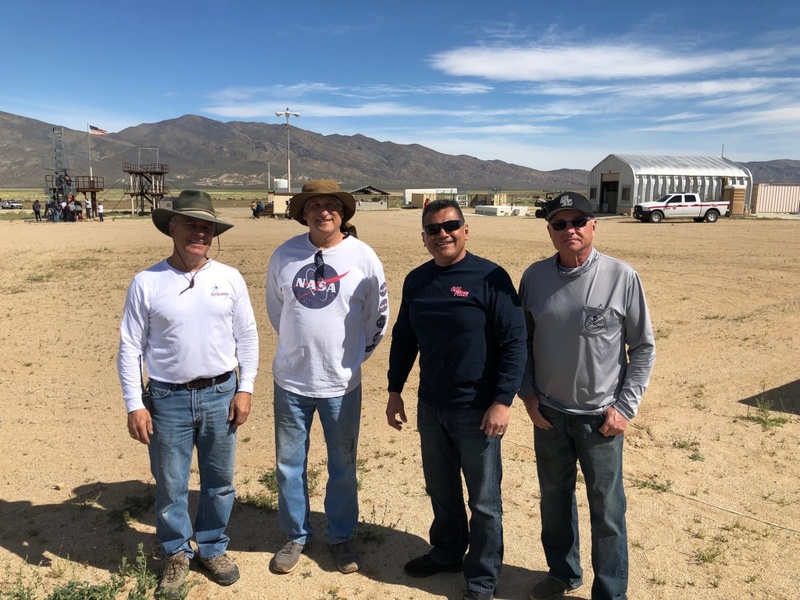 I had the chance to meet Cris Erving of Eggtimer Rocketry at the last Rocketry Organization of California (ROC) launch event in Lucerne Valley on June 9, 2018. I hope we can get an altimeter payload ready to fly in a standard alpha payload tube by the July 7th launch. The new RRS membership card design has been finished. Many thanks to Bill Janczewski for pulling this together. We have had a few requests for membership cards from members and the RRS has agreed to produce these only on demand. 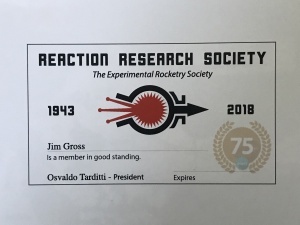 Jim Gross will be the first recipient of this new style of RRS membership card. This year’s design has the 75th anniversary watermark on it. There was some general discussion about the payment of dues. Even as we are growing in membership in our society, the RRS has not been collecting dues on a regular basis. We’re content to primarily use the honor system and gentle reminders to our membership to pay their annual dues of $40 per year or student memberships at $20 per year. It is this small revenue that helps the RRS stay on top of our bills. Student memberships are good as many university projects can require multiple tests at the RRS MTA which is covered with signing the RRS indemnification form and paying membership dues to the RRS. All membership applications must be sent to the RRS president and approved by the RRS executive council. 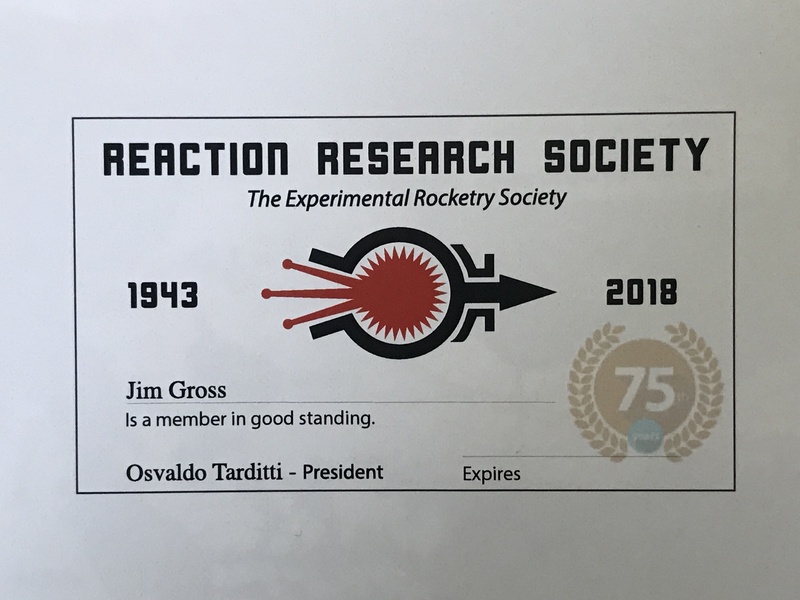 Payment of RRS dues ($40) and the added cost of a membership card ($5) can be done by check and through the Paypal donation button we have on the RRS.ORG website. It’s important to make a note on Paypal that you’re paying your Membership Dues. The extra price of $5 for membership cards is pretty small and compensate for the cost of low-volume production as most members may not opt to get one. To those desiring a membership card, please contact the RRS secretary. For all of our regular membership, I had proposed that the RRS return to using membership cards which were used in the past in the society. Membership cards were issued to all members upon payment and re-payment of their annual dues. This provides a physical mechanism to verify that each member is in good standing with dues paid. The membership cards would have their name and an expiration date that says when annual dues must be paid again. 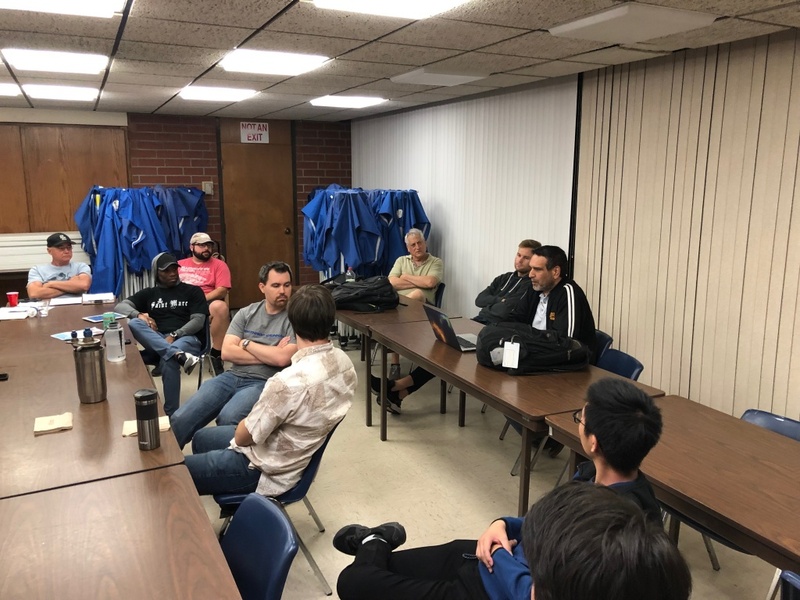 Although some felt the idea had merit, others felt that we should continue to have the council take the initiative to track payments and remind members to pay their dues as we have been doing. Since members join at different times in the year, this can get complicated but we will rely on members to stay on top of this. 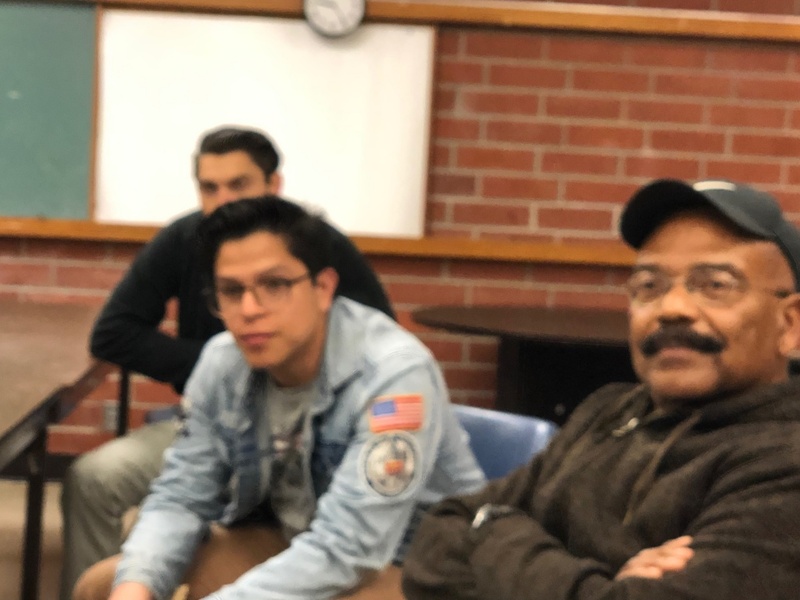 It was a good discussion that also raised issues about what constitutes “active status” in RRS membership and our broader membership policies including corresponding membership for those who live outside of the Los Angeles area but want to remain a part of the RRS in some capacity. It was agreed to revisit this broader topic in the July 2018 meeting as some of our newer members may not be familiar with the past and current membership policies at the RRS. Sam Austin gave his presentation the Hercules Rocket Engine project at MIT. His liquid rocket propellants are LOX and kerosene. Sam was kind enough to bring his liquid motor that he is finishing. It’s a 500 lbf, 600 psi LOX-kerosene engine with an unlike impinging injector. His stainless steel chamber with a graphite nozzle insert ought to hold up to short burn durations. 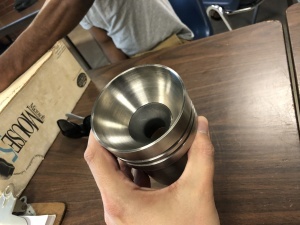 Everyone was able to inspect the injector, chamber and nozzle parts that Sam made at the MIT machine shop. The delicate work to get a clean injector pattern was impressive. He’ll be water flow testing the injector soon to verify that everything looks right. 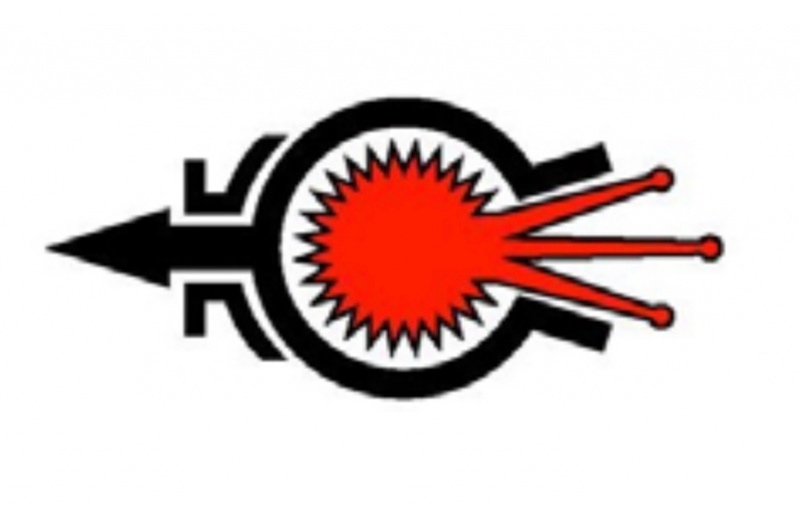 The RRS recommended Specialized Coatings, a ceramic coating vendor in Huntington Beach, that we have used with success in the past on alpha and beta nozzles. Sam is still working on the propellant feed system. He already has a pair of liquid carbon dioxide vessels that are of the right size. After safely removing the original valves and getting the rest of his control plumbing, he will hopefully have what he needs to conduct testing at the RRS MTA or at FAR next month in July 2018. There were a few questions about different features of Sam’s liquid motor, but overall it looks like it should work. Sam is getting prepared to finish the propellant supply system for a static fire of this rocket motor. With luck, he should be able to get into hot-fire at the RRS MTA or FAR site next month and hopefully before he returns to MIT in the fall. We are glad that Sam has decided to join the RRS as a student member. The RRS membership had a few suggestions for improvement and a few recommendation for low cost regulators, ball valves and relief valves that have been used in other amateur and professional projects. 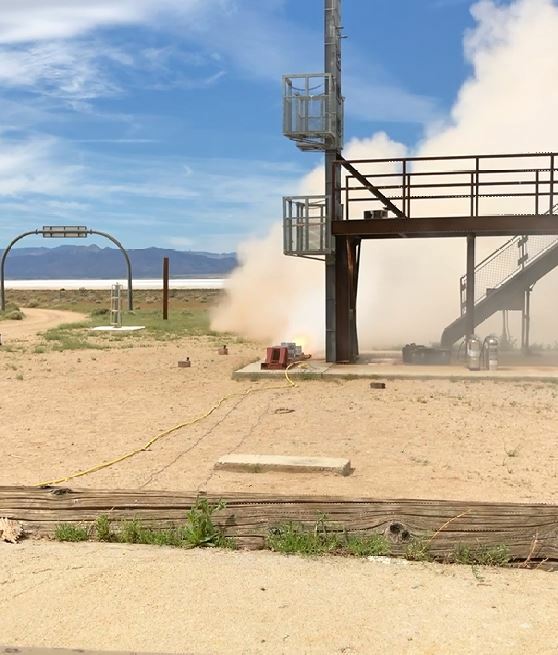 [+1] We managed to talk about one bonus topic by showing the video from the vertical static fire of the vehicle-sized solid motor by Jack Oswald and his team at the RRS on Thursday, June 7th. 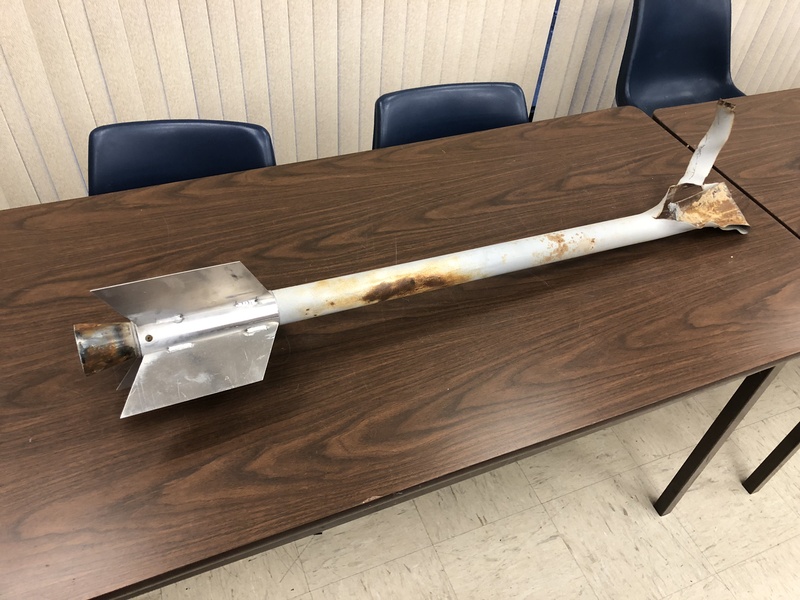 The video clearly shows a nozzle failure after two seconds from start, but it seemed that there may have been grain fracture leading to a partial blockage of the nozzle and then the resulting pressure surge shattered the nozzle. We may upload the video to our YouTube channel once we ask Jack and his team. Hopefully, Osvaldo can extract a few still photos from his footage. I think some of those stills will show an impressive start followed by a change in the flow pattern and abrupt failure with ejecting fireballs of propellant that followed. 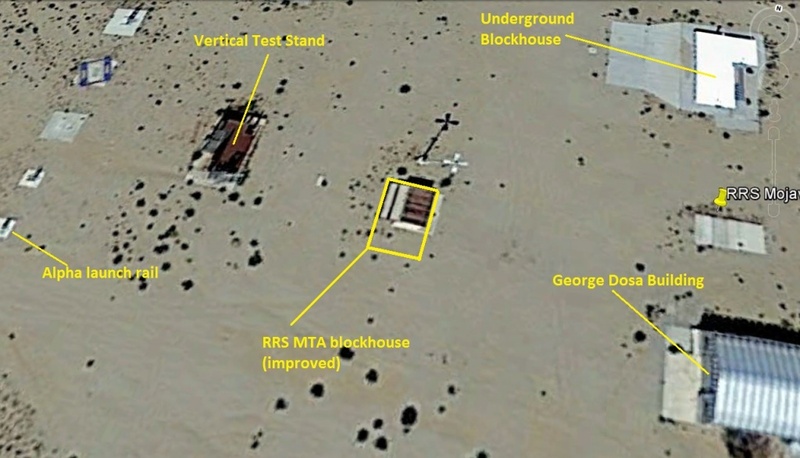 The RRS works safely and are glad to have our own remote testing site like the MTA to do these larger projects. Sam’s presentation was very engaging, but we ran out of time before the Community Center closed at 9:00PM. We did not address all of our main agenda items or some of those added at the last minute. We will roll these topics to the July 2018 meeting. + We did agree to discuss the topic of RRS membership policy and what constitutes being an active member. + Also, on the meeting agenda for July 2018 is the quarterly update on the SuperDosa project. I hope to have something ready to present by July 13th. 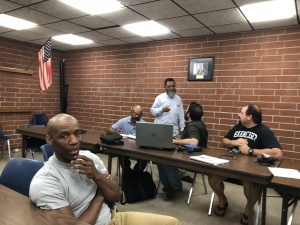 Again, we will have another launch event at the MTA on July 21th with the LAPD CSP program and member projects to be discussed later. The next monthly meeting will be July 13th at the same place and time (7:30PM).